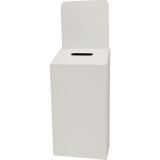 We carry a full range of competition Entry boxes (often referred to as Ballot Boxes) to suit most applications. 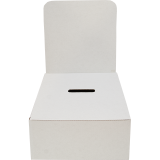 From the smallest counter top unit to the extra large floor standing unit, you are sure to find a product to suit your needs. 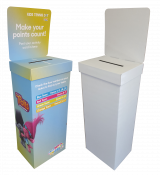 You may choose from table top or floor standing units and choose to add printing to just the header or the entire unit. All are designed with header cards that attach separately, to make the application of promo material easier. note: when you choose your items there will be a link to inexpensive double sided tape to suit.